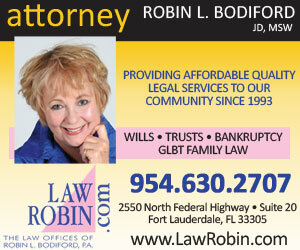 There are few people that have done as much for the South Florida LGBT community as Jodi Reichman. She has more than 30 years of working and volunteering in South Florida, from her efforts as President of the NAMES Project South Florida chapter of the AIDS Memorial Quilt to Transgender Services Coordinator for The Pride Center. As an ally and longtime LGBT worker, she’s constantly finding ways to make the community better, and her inspiration is pretty close to home. Through all her work, including trans services at The Pride Center, Reichman knows there is more to be done when it comes to support and help for the LGBT community.